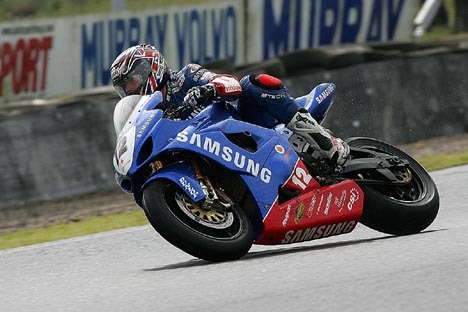 Sean Emmett, who usually races the Samsung Ducati in the Metzeler National Superstock Championship, was promoted to run in the Superbike class aboard the Samsung Suzuki due to his team-mate Dean Thomas crashing during free practice and cracking two ribs. He took home two ninth place finishes for the team at the seventh round of the Bennetts British Superbike championship at Knockhill in Scotland. Thomas had been testing some new tyres and was running in about eighth to ninth place when his crash happened. “We tried some different spec tyres in the second session and went forward. I was comfortable in eighth which is great, plus they were consistent laps which would do full race distance. I just got caught out - I came out of the chicane and I didn’t go over it any quicker, I just changed direction marginally faster than I had previously,” he explained. With Thomas out of action, Emmett stepped in and qualified in twentieth place, having got caught out when the rain started just twelve minutes into the session. However, his lowly qualifying didn’t stop him getting through the pack in both the wet races. The eighth round of the Bennetts British Superbike Championship takes place at Oulton Park on the 13th – 15th July.